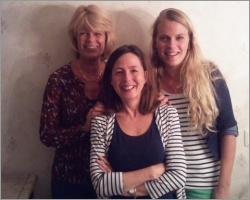 Natasja van der Lelij (right) is the founder and chair of Odanadi Netherlands. In 2008 she visited Odanadi for the first time and volunteered for several months. She was moved by the crucial work of Odanadi and inspired by the vision of Stanly and Parashu. Back in the Netherlands, she set up the Dutch Foundation. Natasja works in everyday life as a social worker. Yvonne van der Lelij is Natasja’s mother and also very involved with Odanadi. Yvonne (left) works as a doctor ‘s assistant and is the treasurer of Odanadi NL. Jacqueline Blase (the middle) got involved in 2011 via twitter and immediately felt attracted by the project and offered her assistance. She is the secretary of Odanadi NL. In daily life she works as a consultant in patient communication and also as counselor in a large hospital.